The pilots of the Bristol Channel and the River Severn played a vital role in ensuring safe passage for ships approaching and leaving the entrance to the canal at Sharpness. This page provides a brief introduction to that role, and another page compiled by Alex Wood lists information about individual pilots. In the early days of the canal, pilotage in the Bristol Channel was controlled from Bristol, and Trinity House licensed additional local pilots for the very difficult tidal waters of the River Severn from King Road (at the mouth of the Bristol Avon) to Sharpness. Each pilot owned or shared a sailing cutter in which to go seeking incoming ships needing guidance. Some would sail well down the channel, hoping to meet a large ship that paid a high fee, but a Bristol pilot could always claim precedence below King Road. This meant that ships on their way to or from Gloucester often had to pay for two separate pilots. To escape the control of Bristol, powers were obtained in 1861 to establish the Gloucester Pilotage Board who appointed their own pilots to guide ships in the Bristol Channel as well as in the Severn to and from Sharpness. This encouraged pilots to cruise further down the channel, competing with their colleagues to board the big ships. Most of the Trinity Pilots continued under the changed arrangement, and new applicants were required to serve an apprenticeship with an experienced pilot and spend some time on deep sea vessels. To keep their knowledge up-to-date, each pilot was required to carry out regular surveys of the river at low tide. 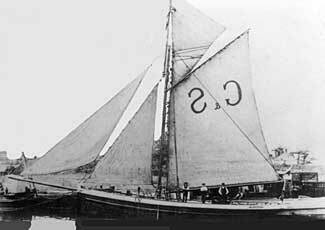 To distinguish to which port they belonged, each Gloucester cutter was required to have G&S displayed on its mainsail. Most of the pilots lived in the small hamlets near Sharpness. Thomas Price (picture right) was in charge of the barque Director, the first ship to enter the New Dock at Sharpness in 1874. His father and his son were also pilots, covering over a century between them. 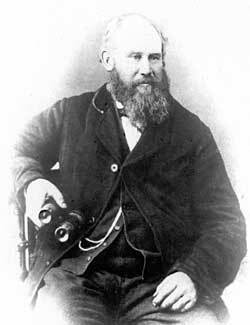 Albert Everett was specially commended in 1883 for successfully piloting the 2,000 ton steamer Inchmaree to Sharpness after the spring tides were past their peak. For completing this tricky task, rather than let the ship discharge at Avonmouth, the Sharpness merchants gave him an engraved silver cup and a purse containing seven guineas. The competition between pilots rewarded those who were adventurous and lucky, but it was also wasteful of skilled resources, and in 1904 the pilots formed their own company and changed over to taking ships in rotation. 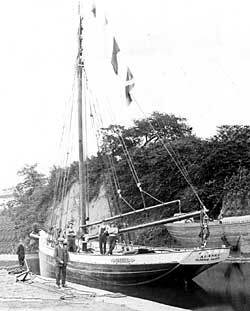 Ten years later the Gloucester pilots combined with other pilots in the Bristol Channel to maintain steam cutters at fixed locations, and the sailing cutters were sold. See the Gloucester Harbour Trustees website.